The streets were relatively quiet. It’s summer in the City (don’t you dare start singing The Lovin’ Spoonful!). Where are the kids? Other the occasional break out two-hand football or a soccer game, or the always popular open fire hydrant on the oppressive days, you really don’t see young children playing in the streets anymore. Once upon a time when inner city children played outdoors it was not varsity. We played in the schoolyards, on the sidewalks and in the streets! I know this is something damn near unfathomable in this X-Craft Station day and age (see what I did there? ), but it happened. I have the scars and wonderful memories to prove it. In fact, kids pretty much ruled the streets, at least until the street lights came on (don’t act like you don’t know what that means!). We learned how to get along, even I couldn’t stand that nasty little Devon from Creston Avenue who had cooties and oh – er – excuse me – I digress… We learned how to deal with each other. We learned to play by the rules (whatever they were per game, per moment). The blocks in front of our apartment buildings were our backyard. We played games such as stick ball (or curve ball, if you didn’t have a stick), ring-a-levio, steal the bacon, Johnny on the Pony and of course Skelly (a.k.a. skully, skilsies, skelsies). I found this picture of a Skelly board online for reference. Now this is some fancy/schmancy Skelly board painted here. When we were kids, we’d draw this out with our white chalk. Even if we had some of those big, get dust on everything color chalks, it never looked as good as this, but we got the idea. Once the board was drawn we make loadies, if needed, melting candle or crayon wax or tar into bottle caps to load them (give them weight), then we would scuff them up on the street to make them slick enough to slide. There was a start line two feet away from the actual square. (That is two feet, as in one child stepping at the edge of the number 1 box and placing one foot directly in front of the other for “two feet”.) 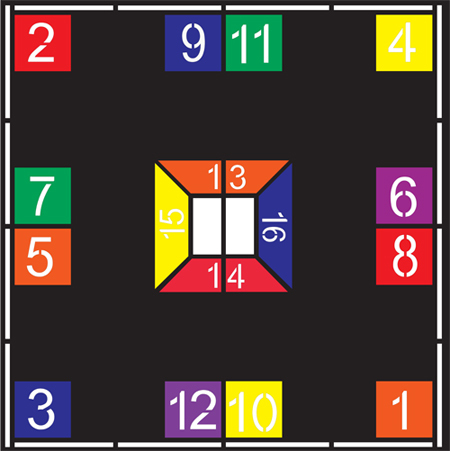 You’d slide your bottle cap from the start line into the square marked number 1 and work your way around until you made it into the center, number 13. There were a ton of rules, to make it fun and challenging. Above all, you had to remember to grab your loadie out of the street before a car would run it over or you were out the game, because unless you had another one ready to go, odds were the other players were not waiting for you to make another one. With the advent of video games, sports more organized in schools and kids having an extracurricular activity calendar as jam packed as any executive’s 9 to 5 schedule – being told to just go play, is not the same as it was when I was a child. As a result, some of these street games are dying out and that is a shame. This morning on my way to work I saw a man rolling what had to be a four foot square Skelly board on a hand truck and it brought back memories. I have seen the occasional Skelly board show up professionally painted on grounds of a schoolyard over the years, but it seems the popular street game is now making its way indoors. And I have to say, it is an odd comfort to know that kids still play the game, indoors or out. Wanna Kick the Can anyone…? I remember blocks being officially closed off as “play streets” and fire hydrants being run in the summer heat. We had a playground at our development but we still used the streets. I never thought I’d miss screaming children in the street, until I did, lol. differnet <—- did you see what I did there??? It was a typo, … but did you see what I did there? hahaha I crack myself up sometimes! Ahahaha! And I thought you were being punny – different/internet a little jab at these crazy modern times. I was much more of a country kid- even when in “town,” I was playing in the vacant lot, pulling pieces of bubbling tar from the street, foraging buds off plants (thankfully turning out to be edible) and sneaking across the highway to look at the peacocks and hope one had shed a feather. In the actual country, it was even better. There was a ring of enormous upturned stumps whose entwined roots made a fort with great shelves and cubbies. When it rained, we had an indoor fort in the barn, having pulled out all the hay bales and restacked them to make an indoor room with a hidden entrance. And we had a pond with lots of frogs, fields to run in, fruit trees to climb. Inside, a ping-pong and foosball table. No hopscotch or Skelly for me, either, not to mention TV, but I didn’t miss it. The difference is, I’ll bet the kids out in those places still play like that. Even if they have a TV. I’ll bet you’re right and they are so much better off for it.